Apple’s new MacBook Pro laptops are fantastic, but it’s also a big step backwards from the previous-generation model in one important way: Apple killed MagSafe. The magnetic charger port that so many people have to thank for preventing their laptops from flying off a table when someone stepped on their power cords is now gone. Thankfully, however, it only costs $19 to get it back. 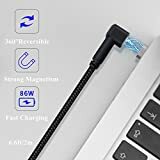 The Power Trend Fast Charging 86W Reversible Magnetic USB-C Cable adds a MagSafe style magnetic charging port to any laptop that uses USB-C for power. This cable could very well be the difference between a close call and a smashed $2,000 laptop. L Side Right Angle Design: this magnetic usb c cable adopted L side interface design to avoid clutter layout and winding, fit your MacBook perfectly and keep desk clean, give you a good mood.